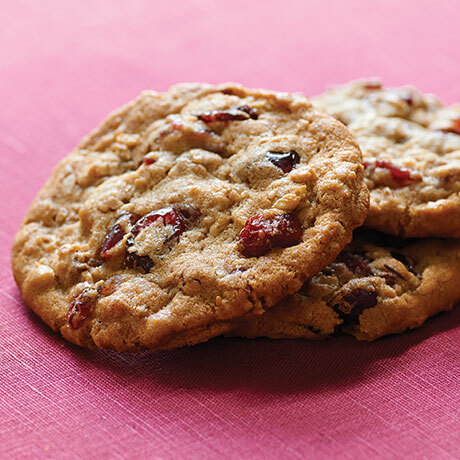 Whole rolled oats with chewy dried cranberries and a subtle hint of cinnamon make this a touch of sugar, spice and everything nice. Approximately 36 cookie dough pieces. SUGAR, MARGARINE (PALM OIL, WATER, BUTTER [CREAM, SALT], SOYBEAN OIL, CONTAINS 2% OR LESS OF SALT, VEGETABLE MONO & DIGLYCERIDES, NATURAL FLAVORS, CITRIC ACID, VITAMIN A PALMITATE ADDED, BETA CAROTENE [COLOR]), ENRICHED BLEACHED FLOUR (BLEACHED WHEAT FLOUR, MALTED BARLEY FLOUR, NIACIN, REDUCED IRON, THIAMIN MONONITRATE, RIBOFLAVIN, FOLIC ACID), ROLLED OATS, CRANBERRIES, EGGS, CONTAINS 2% OR LESS OF: MOLASSES, BAKING SODA, CINNAMON, SUNFLOWER OIL, NATURAL AND ARTIFICIAL FLAVOR.